In a bowl, combine the water, vinegar, sugar, salt and ketchup. In a small container dilute cornstarch in water. Saute onion for 2 minutes or until translucent. Add ginger and cook for 2 minutes. Stir in the garlic and cook until golden. Add red bell pepper and cook until soft. Pour ketchup mixture and add garlic powder. Bring to a boil. Lower the heat. Slowly pour the cornstarch mixture while stirring constantly to prevent sauce from clumping up. Continue stirring until well blended. Bring to a boil for 2 minutes and turn off heat. 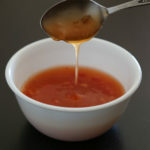 When sweet and sour sauce cools down it will get thick. If you want a runny sauce don’t put too much cornstarch. Stir constantly while slowly pouring the cornstarch mixture so it doesn’t clump up. Keep stirring until well blended. Sauce is good for about 4 days in the fridge.